8,587 others viewed this post. I was going to do more to this image but I had such a positive reaction to it online I think I’ll just leave it. 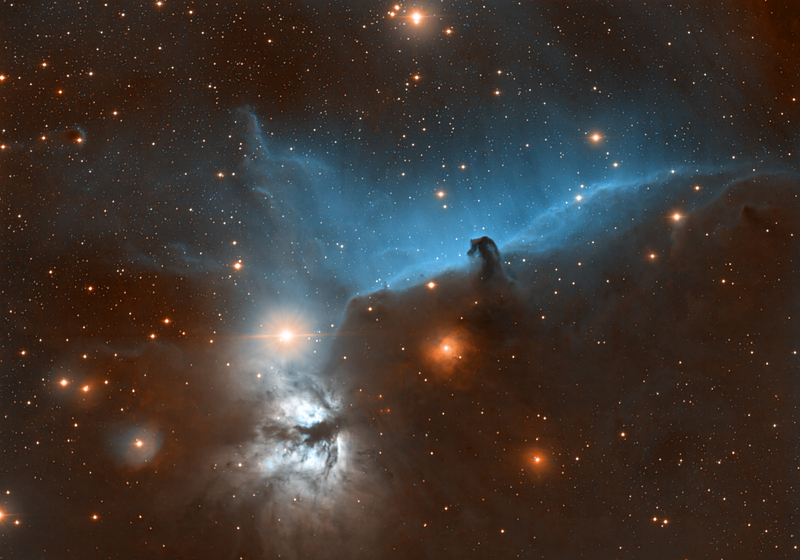 I’ve mapped the Hydrogen to blue which I think makes the Horsehead and it’s surrounding emissions look incredible. Interestingly, although this is a “bicolour” image I’ve only used one filter (Ha) and straight mono luminance so I’m surprised at the colour and dynamic range. The bright star in the middle, Alnitak, is notoriously difficult to photograph around as it can quickly overexpose and dominate the whole region but I’ve managed to tame it nicely so it doesn’t detract from the Flame Nebula below and the classic Horse. Celestron Edge Hd 9.25″ / Hyperstar / Baader highspeed Ha / EQ6. Processing Pixinsight and Photoshop.